France has proposed to terminate the Mistral ships contract, offering €100mn less than Moscow paid upfront, not to mention other costs, and only after Russia allows selling the helicopter carriers to a third party, sources told Kommersant newspaper. The sum which has been offered to Moscow, the paper has learned, is €784.6 million ($895 million), which is substantially less than €1.163 billion ($1.33 billion) Russia has reportedly spent on the military project – including the advance payment, training and new infrastructure. France hopes to get off cheap paying back only the money specified in the work completion certificates, according to the source. Russia understandably disagrees with such an offer, insisting that all expenses and losses should be compensated for by the side which terminates the contract. Russia intends to recover the loses associated with training the 400-sailor crew and constructing docks for the vessels in addition to the €892.9 million ($1,017 million) advance payment. The French side is now preparing arguments to back their proposal, after talking to Russian Deputy PM Dmitry Rogozin, a source in the military-technical cooperation sphere told Kommersant. Moscow will in the meantime review the draft proposal – all as Paris continues wasting an estimated €5 million monthly to maintain the ships. As long as Russia has an end-user certificate for the stern parts of the vessels, “without our permission they can’t sell anything,” Rogozin said earlier, adding that he had already explained the situation to the French. The Kremlin doesn't see the Mistral issue as a problem, the Russian president’s press secretary Dmitry Peskov said. “The issue of Mistral ships is not on the president’s meeting agenda this week,” he said. “The principle applied here is ‘goods or money’,” Peskov said, noting it had already been raised during the recent meeting of the Russian and French presidents in Yerevan. Moscow would welcome either ships or money, Peskov said, yet refused to comment on the issue of compensation for infrastructure and other investments made by Russia as required by the Mistral project. Russian Foreign Minister Sergey Lavrov also believes the Mistral issue has now become purely legal. "Foreign policy aspects of the Mistral issue including the degree of reliability of our partners have been made clear long ago. I am not interested in this issue any longer because it has become purely legal and commercial. As our president once said ... Give the money back as stated in the contract." The French have also allegedly suggested that the costs associated with the possibly of dismantling the Russian-tailored equipment aboard the vessels must be divided equally between parties. Moscow, however, believes that the cost should be paid for by the French side – since it is the one failing to comply with the contract. France apparently wants to use force majeure as an excuse to terminate the contract and relieve itself from obligations, but sources hinted that Moscow is leaning towards a “buy-back” option, stipulated under the French civil code enacted in 1804 , the so-called Napoleonic Code. Under such arrangement France will buy-back the Russian Mistral ships, while Russia reserves the right to put a final price offer, without any explanation. 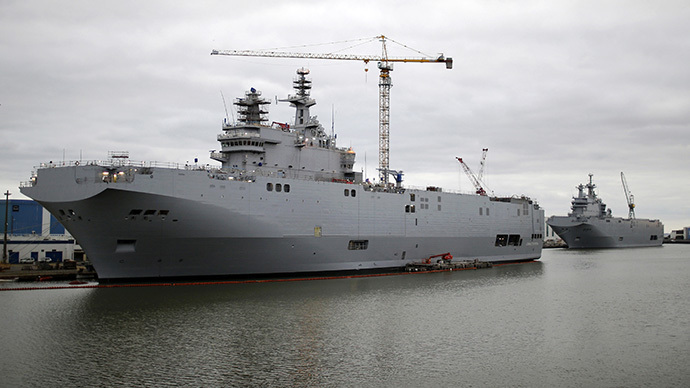 The Mistral helicopter carriers have been the single-most point of contention between Russia and France since President Francois Hollande postponed the delivery of the vessels indefinitely, following the accession of Crimea and Russia’s alleged involvement in the Ukrainian conflict. On Thursday, an article in the Le Point weekly estimated that two Mistral helicopter carriers could end up costing France as much as €5 billion if it fails to deliver them to Russia. Some reports even indicated that unless France gets Russian approval to resell the ships, it may eventually be forced to sink the helicopter carriers.